A huge thanks to Celtic Life International magazine for shining the spotlight on The Haight in its December issue. The magazine, which distributes more than 200,000 magazines six times a year, highlighted The Haight in its Syllables column this month. Editor-in-Chief Stephen Patrick Clare interviewed me about the background of the book and my experiences as a writer of crime fiction. 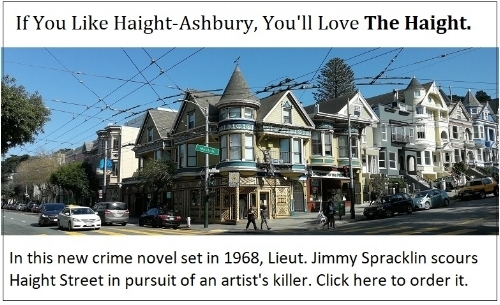 So how does a murder mystery set in Haight-Ashbury end up in a lifestyle magazine for people of Celtic lineage? Well, good question. First of all, there’s the whole Irish cop thing in the SFPD, just as there is in New York, Boston and other cities. Big American cities (even Gotham City, if my memory serves me) all seem to have a healthy dose of blarney in their boys in blue. Clare delved into my Scottish roots, and into how I came to fall in love with Haight-Ashbury and write crime fiction. I admitted that the book’s early drafts were pretty poor, and it was only when I began to respect the genre that the book came together well. Check out the profile and the other interesting articles in Celtic Life. And many thanks to Stephen for such a great piece.